Take a medium size pressure pan and fry the moon dal for 3 to 4 minutes. Then add Toor dal, vegetable, Turmeric powder, Sambar powder (or coriander + chilli powder) and salt. Pressure cook the above ingredients upto 2 whistles. This finishes the sambar. In a small kadai pre -heat 1 tbsp oil, then add mustard, urid dal, red chilli, curry leaves and asafoetida. Fry them for 10 seconds. Add these to the sambar. Serve this with hot idly or dosa. 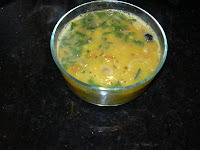 This sambar can be used as a side dish for pongal also. Try this and lemme know your comments. I like this recipe. Will try and let you know. Nice recipe! People liked it. 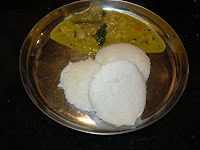 But the quantity of Moong Dal was too much and my sambar was more brown than yellow. Still tasted good and very quick! Thanks for the recipe. Almost read all your posts in this blogpage.